The beautiful forsythia shrubs are in bloom here on the British Columbia coast as I write this article. 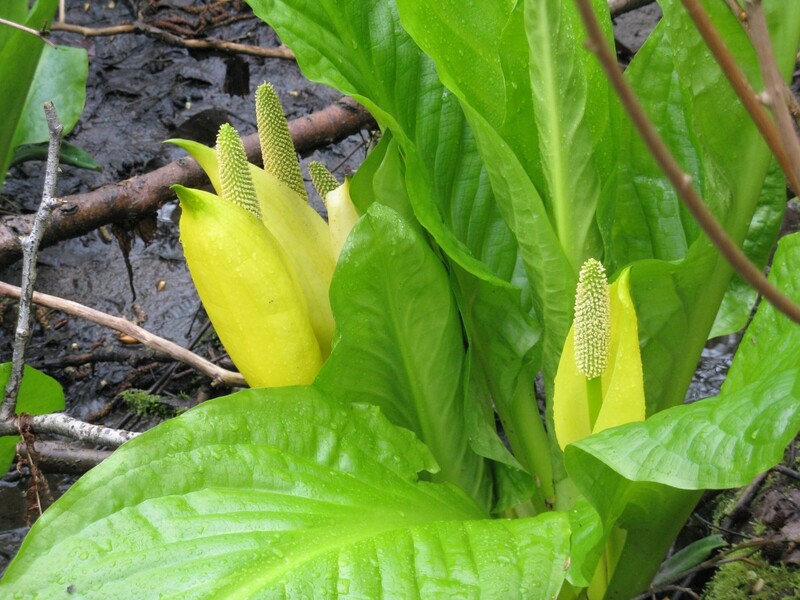 The bright yellow flowers appear in late winter to early spring before the leaves of the plant have fully emerged. The blossoms cover the branches, creating dramatic splashes of colour in both gardens and their surroundings. 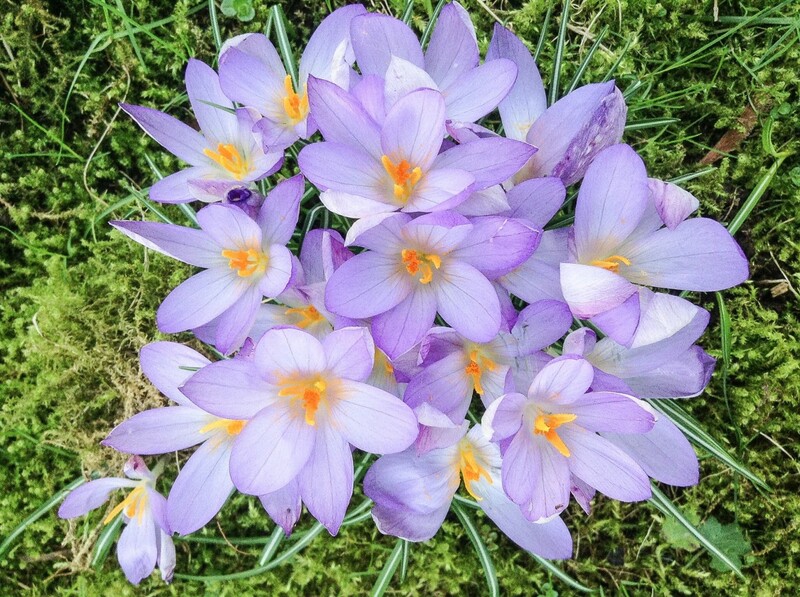 They are a wonderful sign that spring has arrived and are a promise of more floral joy to follow. Forsythia is a genus of flowering plants that are mostly native to East Asia and belong to the olive family, or the family Oleaceae. The genus contains about eleven species. The number of species varies due to debates about how the numerous hybrids and cultivars in the genus should be classified. Forsythias are popular plants that have spread to many parts of the world. They are greatly admired for the glorious yellow flames produced by the flowers. In the UK, the name of the plant is pronounced for-sigh-thia in honour of the horticulturist William Forsyth. In North America, the name is often pronounced for-sith-ia. Forsythia plants grow as shrubs, which can become very large. They may reach a height of up to ten feet and a width of up to fifteen feet, depending on the species. 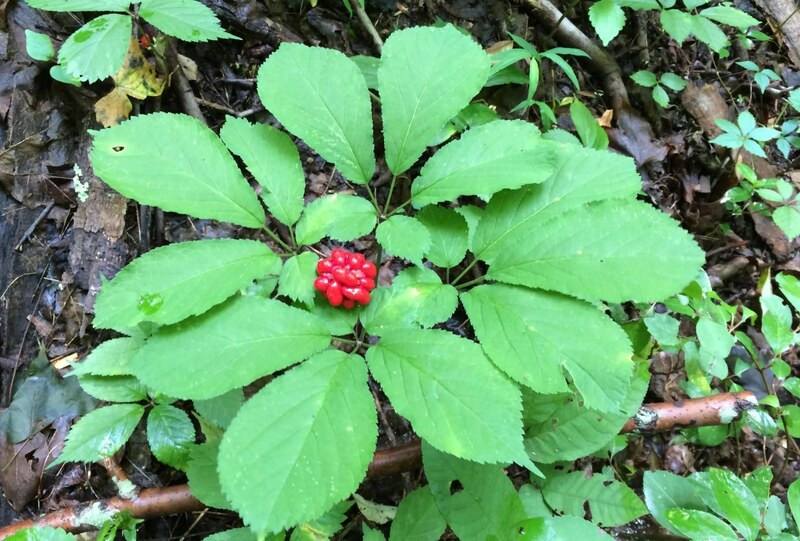 A shrub has multiple stems. Some forsythia stems are so thick near their base that they need to be cut with a saw if they have to be shortened or removed. Many forsythias have stems that arch. The plants can become unruly and produce fewer flowers if they aren't pruned, as I know from viewing the escaped garden plants growing at the edge of a wooded area near my home. Pruning is beneficial because it can produce a healthy plant and a lovely yellow fountain of flowers in the spring, as shown in the photo above. Some people form a hedge from the plants. This can look beautiful when all of the shrubs are in bloom at the same time. 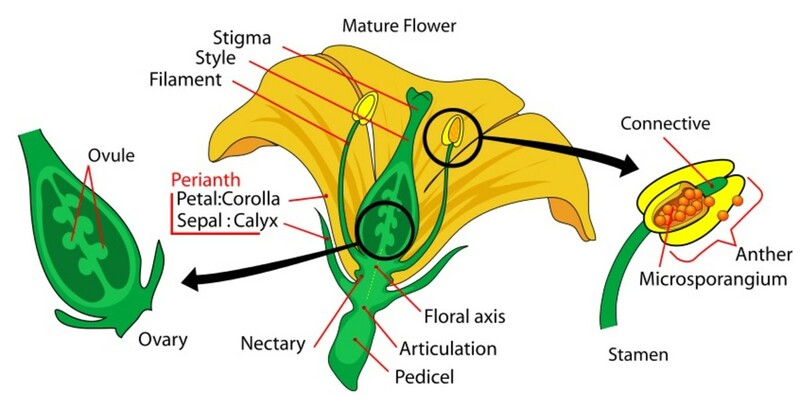 The stigma, style, and ovary form the carpel of a flower. In flowers with only one carpel, the carpel is also known as a pistil. Some flowers have several carpels joined together in their female reproductive structure. In this case, the group of carpels is known as a pistil. 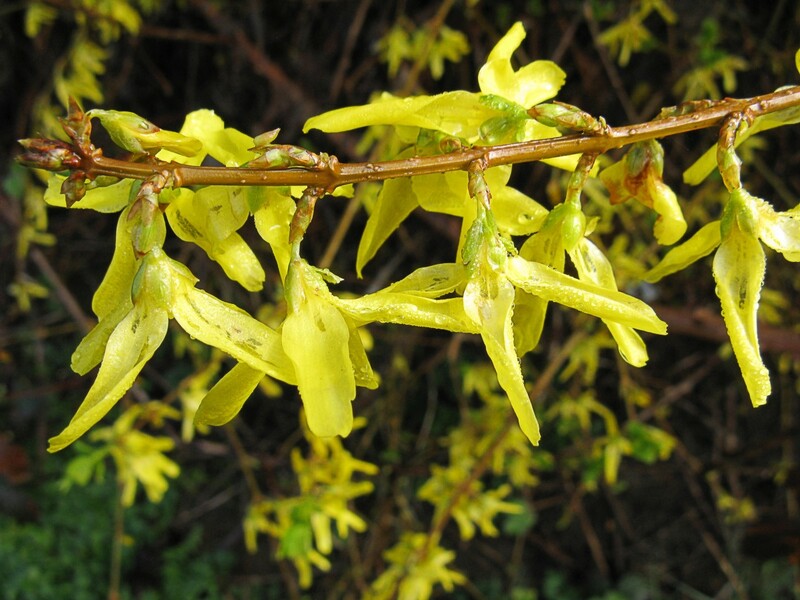 Forsythias have bright yellow to golden flowers. The so-called "pink forsythia" doesn't belong to the Forsythia genus. Its scientific name is Abeliophyllum distichum. Its flowers look quite like those of forsythia but are white to pink in colour, depending on the variety. 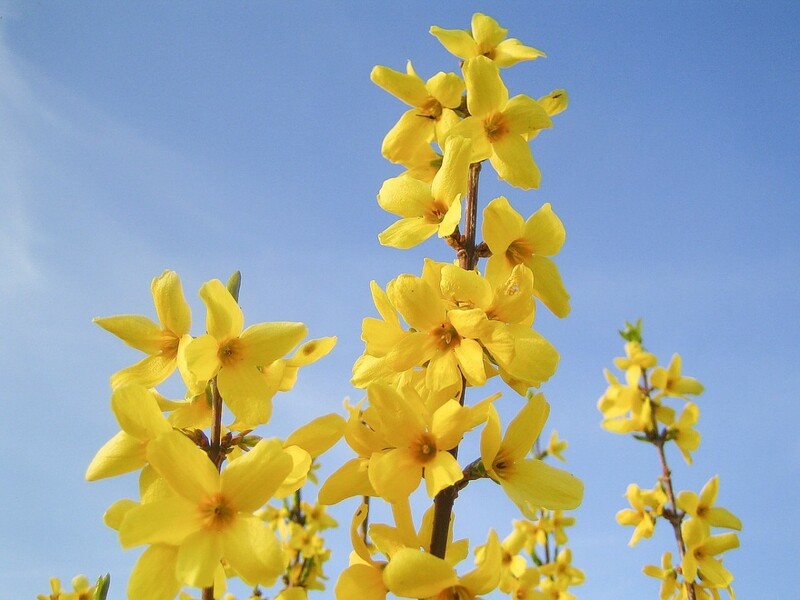 A forsythia flower has four petals that are joined at their base, where they form a tube. The petals usually hang downwards but are sometimes curved backwards, revealing the reproductive parts inside. 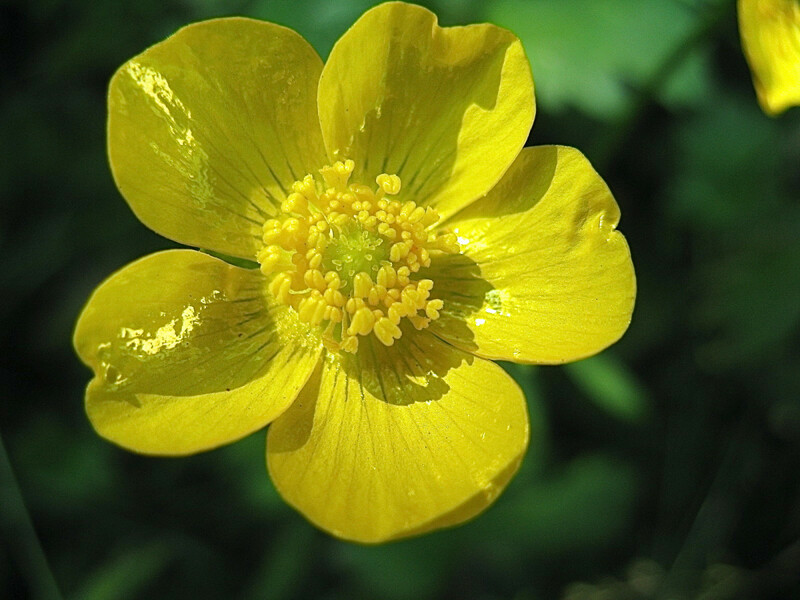 The flowers contain two stamens (the male reproductive structures) and a pistil (the female reproductive structure). The stigma at the top of the pistil is lobed. 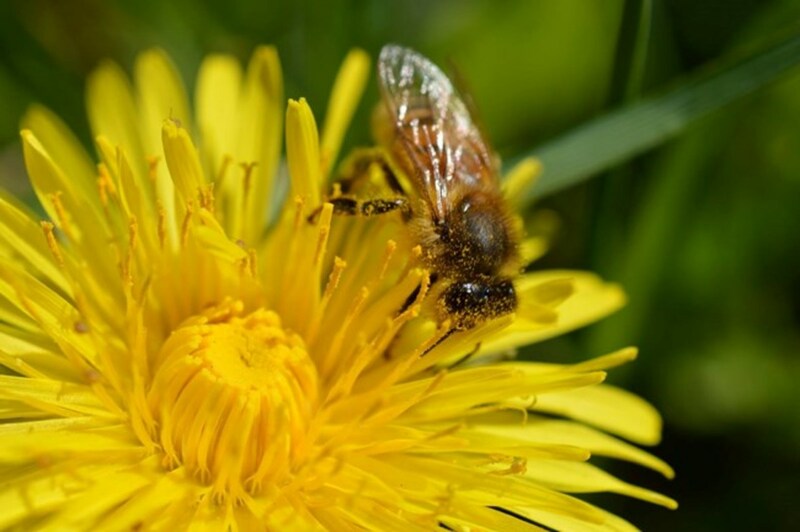 The flowers are pollinated by insects, especially bees. There may not be many of these early pollinators around when the forsythia flowers need them, though in my part of the world there are certainly some. The bees get an early start to their season here. The beautiful flowers last for only a couple of weeks. The flower buds for the next spring form after the flowers have dropped. The buds need exposure to the colder temperatures of winter order to open, but if the winter is very cold they may die. The oval leaves of a forsythia are toothed and have a pointed tip. They become more noticeable as the flowers fade. The shrub is deciduous and the leaves are lost at the end of the growing season. Forsythia leaves often turn a beautiful red or yellow colour in the fall before they drop. Pollinated forsythia flowers produce fruit in the fall. The fruit is an oval capsule which is at first green and then turns yellow and finally brown. When it's mature, the capsule opens to reveal two chambers filled with seeds. Forsythia suspensa fruits are used in traditional Chinese medicine. The plant is commonly known as lian qiao, golden bells, or the weeping forsythia. 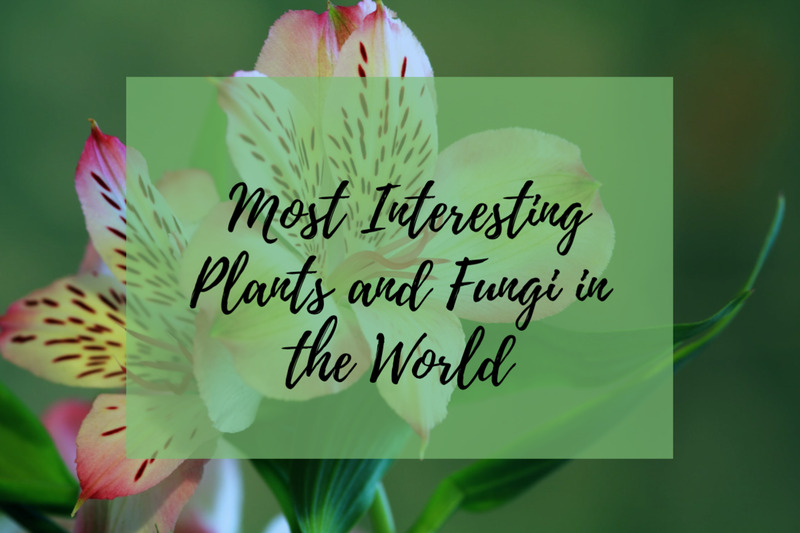 It's a popular ornamental plant in North America. F. suspensa fruits are said to be anti-inflammatory and antipyretic. An antipyretic substance is one that reduces fever. Forsythia fruits and an extract from the fruits are also claimed to be antiviral substances. They are sometimes used to treat respiratory infections and problems such as colds, flu, and bronchitis. There isn't enough evidence supporting these uses to satisfy western researchers, however. Forsythia may or may not be an effective medicine. Forsythia isn't considered to be dangerous when used in prescribed quantities. It's generally recommended that pregnant and lactating women avoid ingesting the plant until scientists learn more about the chemicals that it contains, however. In addition, anyone taking another medicine or being treated for an illness by a doctor should ask their doctor about the advisability of taking forsythia. Natural medicines can interact with pharmaceutical ones. Another important point to consider is that forsythia may slow blood clotting. It's not a good idea to take it before surgery or if another medicine that slows blood clotting is being taken. Forsythia is said to be nontoxic on lists of poisonous plants for pets and humans, as stated in the references below. There is a difference between being nontoxic and being edible, however. Some people report that they eat forsythia flowers, although not in large quantities because the petals can taste bitter. The flowers are sometimes used as an attractive garnish on salads or are used to make an infusion. 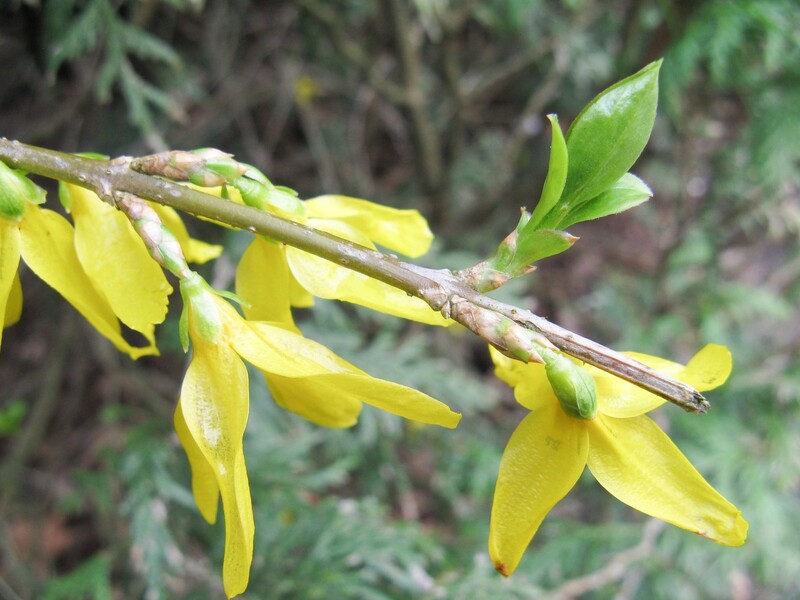 It's nice to know that forsythias are safe to grow in a garden frequented by children and pets. I really think that we need to learn more about the chemicals in the plant and their effects on humans and animals before we forage for forsythias, though. 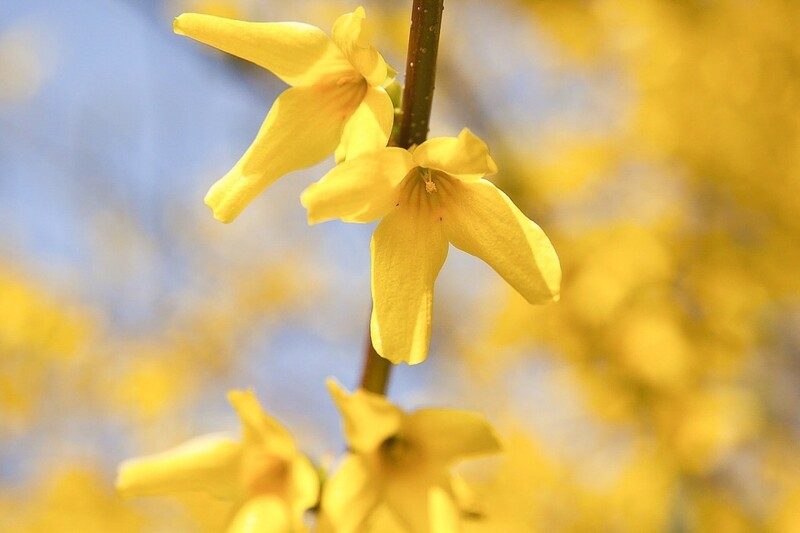 If someone decides to eat forsythia flowers, it's important to be absolutely certain about the selected plant's identity and to pick flowers from an unpolluted area. 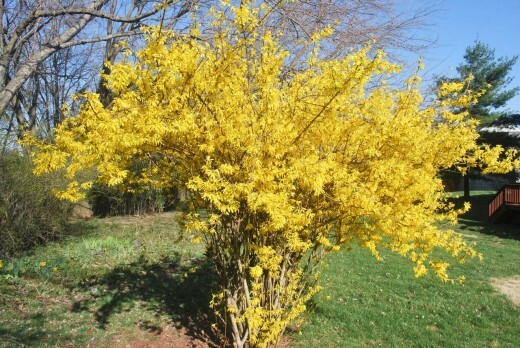 I think that it's also advisable to eat only a small quantity of forsythia until we know more about its effects. The first forsythia discovered by a western scientist was Forsythia suspensa. Carl Peter Thunburg (1743-1828) was a Swedish surgeon and a botanist. He noticed the plant in a Japanese garden and collected some specimens. Thunberg gave the plant the scientific name Syringa suspensa and brought it to Europe. The genus Syringa contains the lilacs. It was soon realized that forsythias had features that were different from lilacs and should really be classified in their own genus. 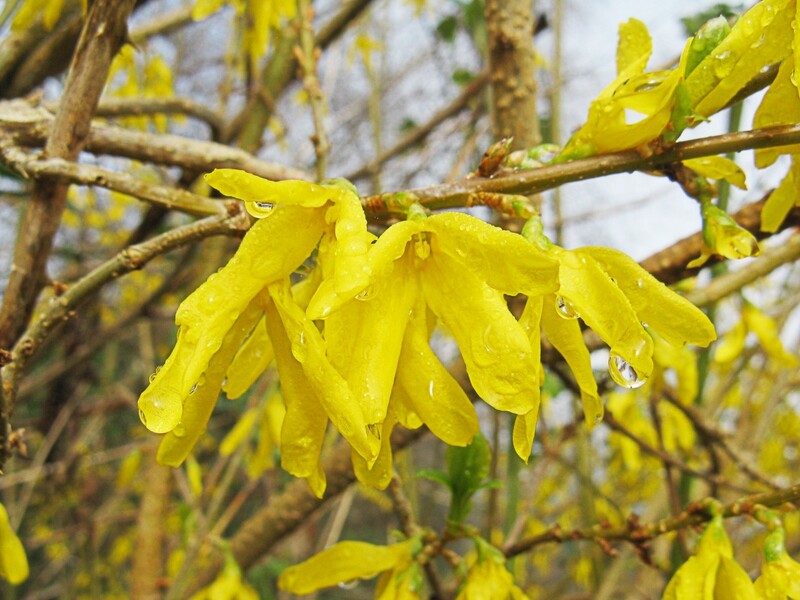 The genus was changed to Forsythia in honour of William Forsyth, a renowned horticulturist of the day. The first forsythia brought to Britain was Forsythia viridissima. It was found in China by Robert Fortune, an avid plant collector. Forsythia suspensa and Forsythia viridissima have given rise to a wide variety of hybrids. A popular cross between the two species is Forsythia X intermedia. William Forsyth was a Scottish horticulturist who lived from 1737 to 1804. Bruce Forsyth, a popular entertainer in the UK for many years, was a descendent of William Forsyth. Bruce became Sir Bruce Forsyth CBE in 2011. He died in August, 2017. William Forsyth was born in the town of Oldmeldrum in Aberdeenshire. He received his training as a gardener at the Chelsea Physic Garden in London. The word "physic" in the garden's name means "healing". 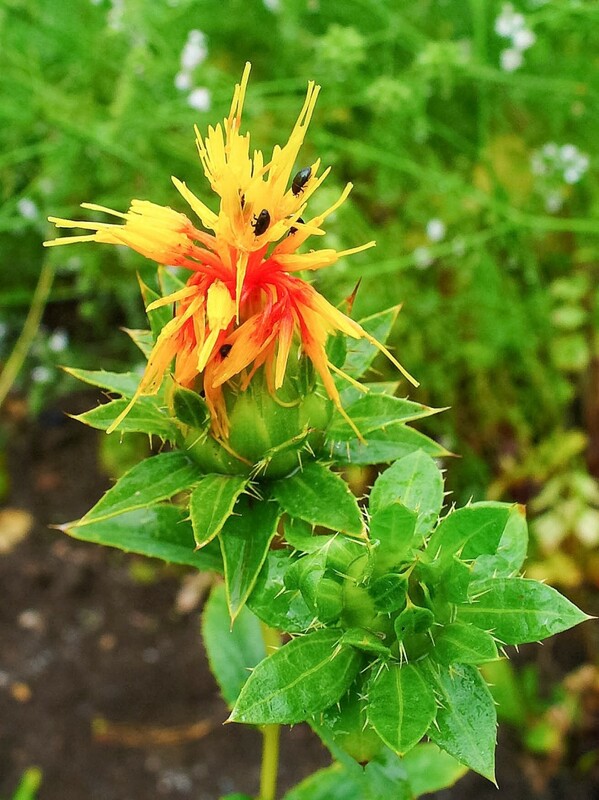 The Chelsea Physic Garden was founded in 1673 by the Worshipful Society of Apothecaries. Its goal was to teach apprentices about the medicinal capabilities of plants. The garden still exists today, although it's smaller in size than it was during Forsyth's time. Forsyth begun his career as a gardener for the Duke of Northumberland. He returned to the Chelsea Physic Garden in 1771 to become its head gardener. In 1784 he became an employee of King George the Third as the Chief Superintendent of the Royal Gardens at Kensington and King James's Palace. Forsyth is credited with being the first person in Britain to deliberately create a rock garden. In 1802 he published a book about fruit tree management that became a best seller. In 1804—the year of his death—he attended an organizational meeting with six other notable men. This meeting was the origin of the Royal Horticultural Society. Unfortunately, William Forsyth was involved in an unpleasant situation shortly before his death. He created a plaster (or "plaister") to be placed over wounds on oak trees, not only allowing them to survive but also enabling them to grow new wood. This was an important endeavour because oak trees were needed to build ships for the navy. The plaster contained fresh cow dung, lime, wood ashes, and sand. Strange as it may sound, cow dung may have the ability to fight certain microbes. Forsyth was thanked by the Houses of Parliament for his creation and given a monetary award. There were claims from prominent people that his plaster didn't work, however. It's hard to tell how serious these accusations were for Forsyth's reputation from the reports that are available today. It's a shame that Forsyth didn't live longer in order to have a chance to answer his critics. It's good that we can remember him in the name of such a beautiful plant, though, even if not everyone knows the origin of the name "Forsythia". Can the forsythia shrub grow in any region? Forsythia can’t grow everywhere, but it does have a wide distribution in Asia, Europe, and North America (and perhaps in other parts of the world). In the United States, Forsythia suspensa is hardy from zones 5 to 9 on the USDA (United States Department of Agriculture) scale. 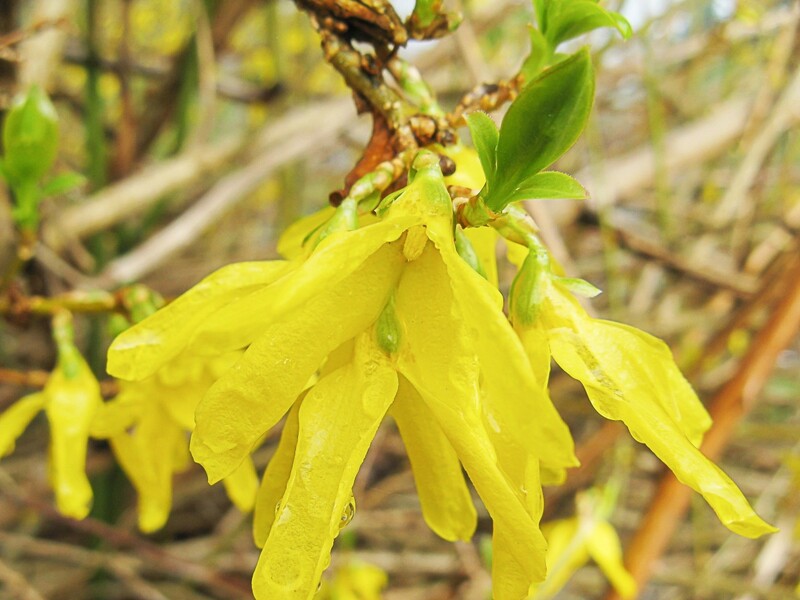 Forsythia x intermedia is hardy from zones 5 to 8 and sometimes to zone 9. Thank you for the kind comment, Alun. I appreciate the share, too. I love rock gardens. They can be very attractive and a great component of a garden, as you say. Thank you very much for the visit, Rachel. I appeciate your comment. Blessings to you, too! Hi Linda. I don't know how I missed this hub. I have several forsythia bushes but never knew how or when to prune them. Thanks for the information and sharing the pictures. Thank you for the comment, drbj! I appreciate your visit. Thank you, Alicia, for this lovely hub featuring both forsythia and William Forsyth and enhancing my knowledge of both in the process. Hi, Deb. Thank you for the comment. Forsythia has a habit of popping up unexpectedly where I live! When I was growing up, I never saw forsythia, only lilacs. When I returned home three decades later, it had suddenly appeared. Not sure what spurred its recent popularity. I never knew about mr. Forsyth, but it was nice to learn where the plant name came from. Thank you very much, Robie. I have some forsythias in my neighbourhood, and I see them beside a trail that I often walk on, too. They are a very cheerful sight! I love those flowers. they are very common in Italy, where I grew up. My whole neighborhood was beautifully spotted with yellow flowers each spring, but I never knew the name of the plant. Great hub! Thanks for sharing. How lovely to have a forsythia that bloomed every time your daughter had a birthday. Mary. This must have been a great way to celebrate the occasion! Thanks for the votes. Thanks, Peg. As always, I appreciate y0ur visit and comment. Thank you very much for the comment, Patricia. I appreciate the votes, the share and the pin, too. The angels are a beautiful way to start my day! Hi, Glimmer. I love the sight of snowdrops! They are such a beautiful sign of spring. Thanks for the comment. We grew this lovely plant when I lived in Atlanta, GA. I don't see them here in S. Florida, though; maybe it's too hot here. I have a beautiful Forsythia that bloomed every March. We called it our "Birthday Bush" cause I have a daughter who was born in March! I enjoyed reading this Hub very much, and voted it UP, etc. Beautiful flower and interesting facts about the plant and it's namesake. I always learn a lot from your articles. I learned so much from this article. I thought I knew a bit about this glorious plant but you filled in many details I did not. I knew little of the man whose name this plant got its name. Interesting the Physic garden is smaller today...one would think, perhaps, it would be larger. And how sad that the incident with the 'plaister' would be a way to tarnish his name. We probably will never know the truth about that situation. And forsythia...love them...My Momma had them all over our property and I was totally enchanted by them. I do not have one right now but once I am settled I will have several. Forsythias just make me smile, just like this hub did. We are just getting our snowdrops here so I am eagerly waiting for the forsythias. Thanks for a little sunshine this morning! Thank you very much for the comment, Vellur. I appreciate the vote as well. An information packed hub about the Forsythia Flowers. 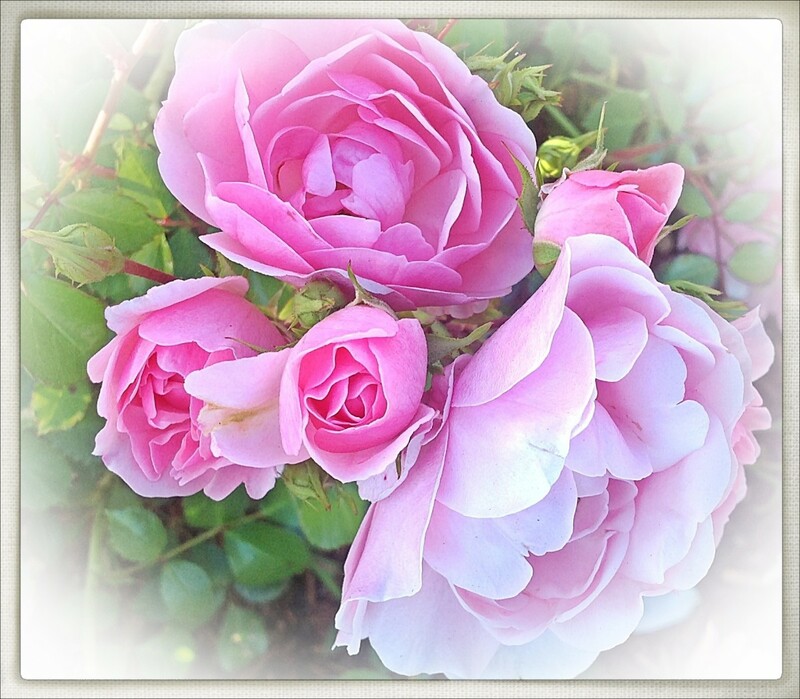 The flowers are beautiful, great hub, voted up. Thank you, Flourish. The beautiful yellow colour of the flowers is lovely. I always enjoy seeing it. The brilliant splash of yellow is always a welcome treat, and I enjoyed reading more about the forsynthia and its namesake. Hi, Suhail. Thank you very much for the comment! I've read many reports about forsythia from people in Ontario, so the shrub seems to survive there, at least in the southern part of the province. I agree about the last photo. I'm a cat lover as well as a plant lover, so I just had to include that photo in this hub! Beautiful hub on a beautiful shrub and a great historic piece on a great gardener! I wonder if forsythia can tolerate the winter climate of Ontario though. 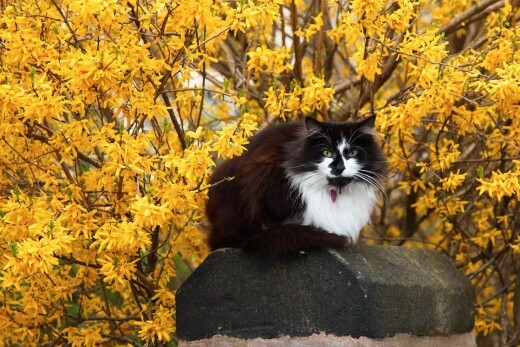 And that last picture with a cat against a forsythia plant - simply priceless. Thank you for the lovely comment, Vagabond Laborer. I appreciate it very much. It's very nice to meet you! Thank you very much, Dora. I appreciate your comment and your kindness. This was a wonderful article. I' have always loved forsythia; it's such a lovely harbinger of Spring. Also, congratulations on being such a prolific and successful hub writer. You use photographs and media wonderfully throughout your articles. Alicia, your articles provide some exciting lessons in nature study. There's so much I learn from you. Thanks for this information on Forsyth and Forsythia--the beautiful yellow. Hi, Bill. I hope your forsythia blooms are lovely when they finally emerge! Thank you for the visit. Hi Linda. We have a row of forsythia separating our yard from the neighbors and we always look forward to the yellow bloom in spring. This year they are still imbedded in snow and the weather has still been very cold so we are many weeks away. How interesting where the name came from, I had no idea. Thanks for the education. Thank you so much, Rebecca! I appreciate your kind comment. What a gorgeous hub, Alicia. I love Forsythia because it is the first budding bush here. You did a great job with this. Enjoyed! Hi, ologsinquito. Forsythias seem to be everywhere in the spring where I live, too! I see them in gardens and beside trails. A flowering forsythia is so lovely. Very interesting. These bushes seem to be everywhere in the spring, but I never knew what they were called. Thank you for the visit and the comment, Maren Morgan! I agree, poetryman6969. Less green waste would be wonderful. Plants have so much to offer us! Thanks for the visit. Thank you so much for the kind and interesting comment, Peggy. I appreciate your visit and the votes and share, as I always do! It's interesting that such a lovely plant has other uses as well. I would like to see us get more uses out of the natural world and to produce less green waste. I well remember the forsythia shrubs that my parents planted on one side of our home in Wisconsin when I was growing up as a child. Sometimes there was still a bit of snow on the ground when they would begin blooming. Sometimes my mother would cut a few branches laden with yellow blossoms and put them in a vase inside the house and we would enjoy the glorious yellow blossoms for a time. I did not realize that it was related to the olive family. It was enjoyable learning about the horticulturist William Forsyth. Thanks for another stellar hub! Up votes and sharing and pinning to my shrubs board. Thank you, Larry. I appreciate your comment! Beautiful pictures and a very interesting history. Thank you very much for the visit and comment, Bill. Thanks, AVailuu. I enjoy reading your hubs, too! Hi, Ann. Forsythia hedges are very attractive! The yellow colour of the flowers is certainly cheerful. I wish the colour lasted for a longer time. Thank you very much for the comment. That was actually fascinating. I had no idea where the name came from. As always, you gave me an education. I always enjoy reading your hubs AliciaC! What a great botany lesson! I love forsythia; used to have it for a back hedge in a previous garden and its vibrant colour was so cheering. I didn't realise it was named after a person. I like to learn something every day! Thanks for an interesting, informative hub with great illustrations. Thank you so much, Audrey! I appreciate your lovely comment and all your support a great deal. I love learning all about flowers and this hub is fantastic Linda. The photos are just lovely. You've provided such interesting information about forsythia flowers. I appreciate these beauties more now that I've read this hub. Voted up and more and sharing. I'm sorry that your forsythia didn't bloom, RTalloni. At least you can look at the plants in your neighbourhood. I'd love to hear you say the names of the flowers in your list! Thank you for the visit and the comment. So interesting--thanks. I agree, it might not be the wisest move to eat the flowers. My forsythia hedge did not bloom this year. All neighbors' plants did, but mine skipped the blooms. Very curious. As a southerner, forsythia is a garden word I love. Saying the name allows me to let my southern accent roll out, making people smile. Magnolia, camellia, forsythia, gardenia, wisteria, mahonia, and more make the drawl lots of fun. Thank you very much for the comment, Faith. I always appreciate your visits! I appreciate your votes and shares a great deal, too. Peace and blessings to you, as always. How ironic for I just had asked a question about what plants or flowers are the first to bloom in one's area, and forsythia bush is one of the ones that blooms first after the last winter frost. I love its brilliant color! So beautiful and adds such a pop to the last days of winter and going into spring. That is interesting about Forsyth's life, but sad he did not live to tell his side of the story. As always, a wonderful read, beautiful and insightful.